The professional AO65 Pump Wedge from Pro-Lok makes gaining rapid access to locked vehicles painless. 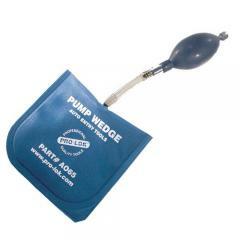 Simply insert the edge of the inflatable wedge into the opening between the door and the body of the vehicle and then use the hand pump to inflate the wedge until the door opens enough to admit a long-arm tool. The rounded corners make insertion simple, while the stiff interior improves both strength and functionality of the wedge. The non-marring vinyl material offers impressive durability, optimal for overcoming stubborn doors without causing any cosmetic damage to vehicles. Full color instructions are included.